Well, tomorrow’s Valentine’s Day. Obviously. And, in usual Katie fashion, I’m scrambling together some last minute things to put the finishing touches on our plans for the day. Unfortunately, it is going to start out with a trip to the hospital, where Baby J is getting his adenoids taken out, and ear tubes put in. Then, Forrest has to head to work, not getting home until 6:30, and Baby J and I will go back home. Exciting, I know. Even though our day isn’t going to be some super-romantic event, I have a few tricks up my sleeves, including a few little gifts for Forrest and Baby J. We don’t go all out on gifts for Valentine’s Day, but I always like to put a little bit of thought into what I get Forrest. That can prove to be difficult though, when you don’t have a ton of extra money, and your apartment has too many things in it to begin with. However, here are a few fun ideas I’ve come up with — either in the past or for this year — that just about anyone can do (and with any budget). They can be used any time of year, for any occasion. A few nights ago, I attended an activity at church with some of the other ladies in my area. 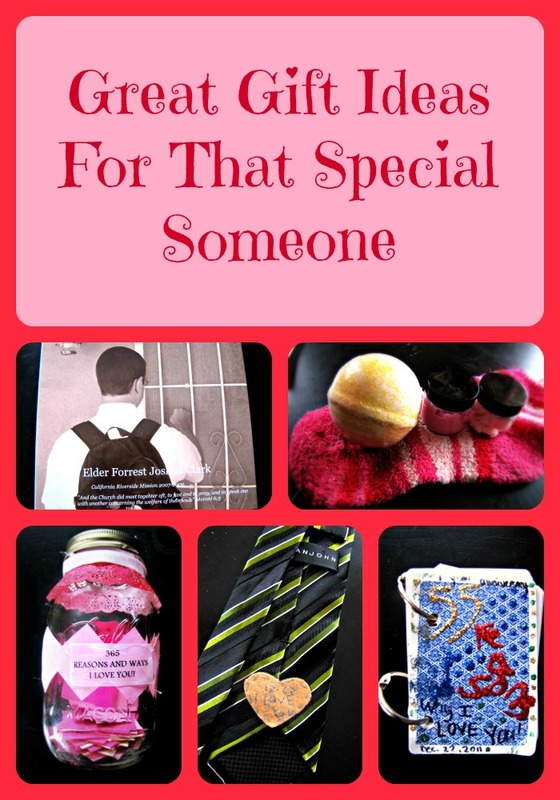 It was all about love, and one of the activities was to make this cute gift for our husbands. Just take some kind of glass or plastic jar with a lid, decorate with fun paper, lace, and ribbon, and then print of a piece of paper that says “365 Reasons and Ways I Love You.” Then, cut out 365 small pieces of paper, and on each one, write either a reason why you love your significant other, or a fun activity for the two of you to do. Just to make it easier, I would color code them — light pink is an activity, red is a love note. Each day, your significant other gets to draw one out. If it’s an activity, you do it that night (or the next most convenient time), and if it’s just a sweet note…they just get to feel a little more loved! It does take a little bit of planning, but I think it’s totally worth it. I can’t wait to give Forrest it this year. The lady who showed us the idea gave her husband a notebook to paste each note in, so by the end of the year, he had a little book of all the reasons and ways she loved him. Forrest has a lot of times. I’m talking, upwards of about 100. I think he accumulated most of them while he was serving a mission for our church. For whatever reason, he really likes having a variety of ties in our closet. For our last anniversary, I decided to pick up a nice, new one — he hasn’t gotten a new on in forever — in his favorite color and then I cut out a heart, stitched it onto the back, and then embroidered a little message with the date of our anniversary on the back. It was really easy to do, but it meant a lot to Forrest (or so he said.) Most of the ties Forrest has have some kind of story behind them, so I was happy to add another one with a story to the bunch. The only materials you need are a tie, a piece of felt, embroidery floss, and an embroider needle. When you stitch it on, make sure that it is only being stitched to the inside of the tie…you don’t want random stitches to appear on the front! Everybody and their mother has probably seen this one on Pinterest, but it’s still worth mentioning. For our first anniversary, I made Forrest this special deck of cards. On each card, I wrote a reason why I loved him, and I secured it together with a ring. All I did was pick up a deck of cards from the Dollar Tree, some glittery paint, and a sharpie, and was able to throw it together really quickly. I’ve seen people do it really fancily, by printing everything out in cutesy fonts, but Forrest loved it this way. Just put your own personal touch on it, and your significant other will love it. It’s great for those times when you just need a little pick-me-up. And I realize that it says 55 reasons..which is three more than a standard deck. I think I must have included the joker cards! This is a project I have just started, but haven’t finished it yet. I’m gathering pictures of all the important places that contributed to our “love story.” I plan to get pictures of all our apartments, the apartments we lived in while we were dating, as well as where we got engaged, the LDS temple we got married in, and a photo of the hospital Baby J was born at. I’m going to make it into a book, and the cover is going to have a couple of different maps with hearts on the specific locations mentioned in the book. Inside, each page will be dedicated to one of those places. Part of me is making it just as a history for our future posterity to look at. We don’t plan to live in the place we are at right now (hopefully not at least! ), and it will be fun to show our kids where it all started out. Obviously, there will be more important places that come up during our life, so I’m going to put a blank page at the end where we can insert more maps and and pictures. Once I get this book finished, I’ll update this post with it. This isn’t something everyone will be able to do, but is an awesome way to preserve memories. As I’ve mentioned, Forrest served a mission for our church in Riverside, California, for two years. He wasn’t very good at writing in his journal. However, those two years were some of the best, yet most difficult, years of his life, and he experienced some amazing things. When we were first married, I asked his mom to send me all the emails he wrote, and when she did that, I went through and put them in a book, with a bunch of photos from his mission. He was so surprised, and excited. I printed the book on Blurb. It was originally going to be 50 dollars, but right as I was about to print it, I found a Groupon where I paid 20 dollars for 50 dollars worth of product! So for 20 dollars, I was able to create a gift for Forrest that hopefully will preserve memories of that time in his life indefinitely. Even if your significant other didn’t have an experience like a mission, study abroad etc. where they wrote lots of emails or letters, you could also do this to compile emails, letters, or even journal entries you wrote during your courtship. Over the years, small details tend to fade, but being able to have them all in a book is a great way to make sure there’s some kind of record available. Well, to be honest, this is something I would love to receive. Who doesn’t love a little pampering every now and then? So for that special lady in your life, putting together a little “spa day” kit would be an awesome gift, especially for Valentine’s Day. You could include bath bombs, lotions, and fingernail polish. I am totally obsessed with fuzzy socks, so I think that would be the perfect addition to the package as well…but that’s just me! If you want to get really fancy, you could make some of these items yourself…or just head over to the local Bath and Body Works to pick some out. Not feeling particularly crafty? Don’t worry, I know the feeling. Luckily for those times, sites like Groupon and Living Social have awesome ideas. To be honest, I was just about to purchase a Sherri’s Berries voucher yesterday, and right as I went to click on it…it sold out. If you’ve never used these sites, you are totally missing out. There’s gift ideas for everyone – men, women, and children! And there’s everything from discounts on restaurants and massages, to photography sessions and electronics. I use these websites a lot, often times to get gifts!